It was a forgettable performance by the first team offense but Nate Sudfeld did he best to impress. His box-score numbers (22-of-42, 312 yards, 3 TD, 1 INT) don’t highlight the fact that his offensive line did him no favors as he was under pressure on an incredible amount of time in this contest and his receivers dropped four passes. He put the ball where he wanted to and avoided putting it in harm’s way in this one, earning what should be a high overall game grade. The Eagles have a problem at left tackle if Jason Peters isn’t ready to go by the start of the season. Replaced by Halapoulivaati Vaitai, who showed in Week 1 of the preseason that he had improved, tonight’s game versus New England was a disaster as he allowed at least a dozen pressures including the strip sack that forced Nick Foles out of the game with a shoulder strain. A couple of the Eagles’ young defensive backs flashed some talent against New England. Rasul Douglas made two plays near the line of scrimmage on the first drive, and Sidney Jones finished the night with a couple pass breakups. The good didn’t come without any bad however, as Douglas and Jones each had a couple of bad moments as well, including Jones getting juked out of his shoes by Cordarrelle Patterson on a screen pass that went for touchdown. In all, the good plays outnumbered the bad for the second-year defensive backs. Fletcher Cox was dominant while he was on the field as he abused Shaq Mason for a couple of early quarterback pressures, while he also got penetration in the run game as well. Cox looks to be in mid-season form just two games into the preseason. Tom Brady played the entire first half tonight, and while his box-score numbers looked strong and he did make some nice plays outside of the pocket, including a first quarter touchdown pass to Chris Hogan, Brady also threw two passes that could’ve been picked off by Ronald Darby. James White got involved early and often seeing five touches (three receptions and two rushes) for 44 yards on the first drive of the game. White ended the night with 92 yards from scrimmage on 10 touches with a touchdown reception from Brady near the end of the first half. It looks like White will be one of Brady’s favorite targets again this season. In fact, the whole Patriots backfield looked strong in Week 2 as Jeremy Hill and Brandon Bolden were both very effective in the run game. Adrian Clayborn likes to feast on backup left tackles (just ask Chaz Green from last season). While his performance wasn’t quite at that level, he still terrorized the Eagles offensive line, specifically against Vaitai as he racked up multiple pressures and two other wins on his pass-rush snaps including a strip sack of Foles that led to a touchdown for the Patriots defense. Philadelphia: While Sudfeld’s performance was key for the Eagles to make the score, decently respectable, the key to this game was the strip sack by Clayborn on Foles. 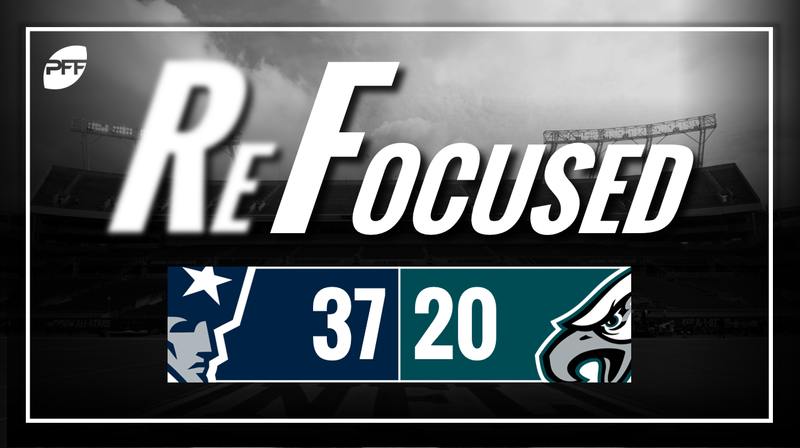 New England: Brady’s effectiveness in the short-to-intermediate passing game tore the Eagles’ defense to shreds and led the Patriots to an offensive explosion.